Our classes are a combination of training, professional coaching, and education. Traditional training prepares you to replicate practices developed by others. Our education gives you the background needed for you to take what you learn and continue to expand and develop new practices for yourself. 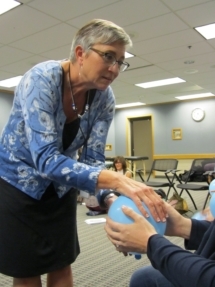 Each workshop includes intensive hands-on practice. We are committed to making sure that you leave with hands-on experience working with model clients from the population of focus. ®one evaluation and coaching so you leave with confidence that you can correctly practice the new techniques you have learned as soon as you return to your own practice. Our workshop space is designed to create a comfortable and safe environment. All of the work that our educators teach is based in a deep and profound respect for the wisdom of the body. The techniques are gentle, emphasizing finesse versus force as we offer the body an opportunity move toward more balance. Many of our workshops are specifically for pregnancy, birth, and newborn care and we are committed to sharing our expertise in care that is led by the client’s own innate wisdom and ability to heal. Northern Lights Wellness Professional Education LLC and our instructors are an approved provider for the following organizations. We are committed to continuing to expand this list based on the needs of our attendees. Debra McLaughlin is a certified Craniosacral Therapist, Certified Professional Midwife, educator, former birth doula, and mother. She has over 17 years of professional experience working with people of all ages using gentle hands-on therapy to restore balance the body. Debra had the great privilege to study with and teaching assist for Dr. Carol Phillips D.C., developer of Dynamic Body Balancing. An avid learner she has been studying Fasciatherapy MDB since 2017 in France. Debra is the founder of Northern Lights Wellness Professional Education and creator of MAP™ for Better Birth. Debra has a private practice serving clients in Duluth MN and travels to teach around the USA and internationally. Adrienne C. Caldwell is a board certified bodyworker. She holds certifications in professional massage, chair massage, reflexology, orthopedic massage & bodywork, and prenatal & postpartum massage & bodywork. She has studied acupressure, craniosacral therapy, and various forms of energy work in depth. Her specialization in prenatal & postpartum care has taken her into the loving arms of several phenomenal midwifery mentors (Adrienne is not a midwife). She has trained as a doula with DONA and Enlightened Mama. In addition, she holds two bachelors degrees, one in music, and the other in marine biology. Adrienne is a consummate learner, and holds teaching as a privilege. Adrienne lives in rural Minnesota with her two children, and her sweet wiggly puppy. She enjoys music, cooking, gardening, all things outdoors, and gym time. Her greatest joy is traveling with her children. MARCELLO WINDOLPH is a certified Fasciatherapist MDB based in Amsterdam. Having trained first in Chinese traditional arts of healing and ‘developing perception’, his passion turned into profession over the years. Marcello’s therapeutic approach is based in western scientific methods as a student of Prof. Dr. Danis Bois (founder of Fasciatherapie MDB and Perceptual Education) and he is currently assisting the Perceptual Education course at the University in Paris and the Fasciatherapy MDB course in Clermont-Ferrand. Helene Jank is a certified Perceptual Psychoeducator MDB, a professional musician and professional theater performer. Helene has attended many seminars with Danis Bois personally, of Fasciatherapy MDB in france and has experience applying Fasciatherapy MDB in her private practise and assisting in various seminars over the last few years. Helene is currently based in the netherlands where she has founded the home of the Dutch international school of Fasciatherapy MDB, Fasciacollege.com. Teaching Assistants: Our educators are committed to personal attention help you develop your skills and will often have their advanced apprentices assist.